Grown Ups 2 is a 2013 American comedy film directed by Dennis Dugan and co-produced by Adam Sandler, who also starred in the film. It is the sequel to the 2010 film Grown Ups. The film co-stars Kevin James, Chris Rock, David Spade, Nick Swardson, and Salma Hayek. The film is produced by Adam Sandler's production company Happy Madison Productions and distributed by Sony Pictures Releasing. The film was released on July 12, 2013. The film grossed roughly $247 million on an $80 million budget. It was nominated for nine Razzies at the 2014 Golden Raspberry Awards. In the film's opening in the Feder household, Lenny wakes up to find a wild deer standing next to his bed. Lenny tries to get his wife Roxanne to open the window. She wakes up abruptly and startles the deer, causing it to urinate all over the bed and on Lenny. The deer runs down the hall and crashes into the bathroom where it runs into Lenny's elder son Greg showering, scaring him and making the deer urinate on him. It turns out that Lenny's daughter, Becky, left the door open overnight for any animals that wanted to come in. Lenny is able to get the deer out of the house by using Becky's monkey doll, which rips it apart, devastating her. Greg, Keith, and Becky then go to their last day of school. Roxanne brings up the idea of their family having another baby, but Lenny says their family is perfect as it is, angering Roxanne. At the Lamonsoff household, Eric Lamonsoff and his wife Sally are at loggerheads with each other over how to raise their children- Sally believes in unwavering support while Eric prefers to be more practical with them, as proven for their son's bad math skills and daughter's eccentric sense in fashion. At the McKenzie household, Kurt surprises his wife Deanne with a thoughtful anniversary present, only to find that she has completely forgotten. Meanwhile, Marcus Higgins is waiting at a train station after receiving a letter from an old girlfriend, who tells him that he has a seventeen-year-old son Braden. Marcus is shocked to see a tattooed, six-foot-tall boy, who turns out to be Braden. Marcus tries to be nice and takes him to school, but Braden displays immediate hatred toward him, believing that he abandoned him and his mother. After dropping off their kids, Lenny, Eric, Kurt, and Marcus form as a group and spend the day roaming around town, reminiscing about the amazing summers they used to have when they were little, and about Lenny's bully, Tommy Cavanaugh. Lenny argues that he could take Tommy as a little boy and he can still take him. Eventually, the friends go to see Becky's ballet recital, where Lenny runs into Tommy, by whom Lenny is visibly intimidated. Tommy threatens that if Lenny ever lies again about being able to beat him up, he will publicly attack Lenny. Once the kids are out of school, Lenny, Eric, Kurt, and Marcus decide to visit the old quarry, where they used to swim as little boys. However, they encounter Andy and his gang of college frat men, who force them to jump naked into the quarry lake. Braden, who was partying with the frat men, witnesses this and goes off to vandalize their frat house. When the frat men return, they swear to take revenge. Lenny arrives home to help Roxanne set up for a 1980s-themed party for their friends. Meanwhile, Marcus begins to bond with Braden. As all of their friends begin to arrive, Roxanne urges Lenny to consider having another baby. Lenny continues to protest the idea and is left speechless when Roxanne reveals that she is pregnant. Lenny, feeling overwhelmed by this discovery, goes off to drink with his friends. The Feder's party goes well most of the night until Tommy Cavanaugh shows up and disrespects Lenny in front of everyone, so Lenny challenges Tommy to a fight. In a surprising turn, Tommy decides to take a dive so that Lenny can look tough for his own bullied son, and the two develop a mutual respect. Soon after, Andy, along with his friends and their entire fraternity gatecrash the party, looking for retribution for the damage to their frat house. When they go on to insult the local town residents, Dickie Bailey, Lenny's old nemesis, points out that Lenny accomplished more in his life than the entire frat put together, inciting a fight. The locals hold their own against the frat men and eventually send them fleeing the scene. After the battle is over, the four friends, plus Bailey, have pancakes at Eric's mom's house. After sharing an embarrassing photo of him and Bailey in kindergarten, Mrs. Lamonsoff reassures Lenny that a new baby is a wonderful thing and eventually he will never be able to imagine life with just three kids. Lenny has a change of heart and returns home, telling Roxanne he is sorry and excited about the new baby, and they reconcile. Filming of Grown Ups 2 began on May 2, 2012, in Massachusetts, United States and ended on July 15, 2012. Columbia Pictures and Happy Madison Productions distributed the film. The film was written by Adam Sandler, Fred Wolf and Tim Herlihy and directed by Dennis Dugan, Sandler's longtime collaborator. The film was released on July 12, 2013 in the United States. It was released on August 9, 2013 in the United Kingdom. Rob Schneider did not reprise his role from the first film because of scheduling conflicts and his wife was pregnant during production. The film is the first film sequel that Adam Sandler has starred in. The movie also has a role played by WWE hall of famer Steve Austin. Stand-up comedian Chris Hardwick confirmed a cameo as an ice cream vendor via his Facebook page. Additionally, the film features a cameo appearance by sportscaster Michael Kay and includes Shaquille O'Neal as a cop. On July 10, 2012, it was announced Arnold Schwarzenegger's son, Patrick, would be appearing as one of the frat brothers. Oliver Cooper was offered a role as one of the fraternity brothers but had to back out due to scheduling conflicts. The first trailer for the film was released on April 2, 2013. The film was released on July 12, 2013 in United States. Grown Ups 2 grossed $133.7 million in North America and $113.3 million in other territories for a worldwide total of $247 million, against a budget of $80 million. It made a net profit of $48 million, when factoring together all expenses and revenues for the film. In North America, the film earned $16.3 million on its opening day, and opened to number two in its first weekend, with $41,508,572, behind Despicable Me 2. In its second weekend, the film dropped to number four in the United States, grossing an additional $19.9 million. In its third weekend, the film dropped to number five in the United States, grossing $11.6 million. In its fourth weekend, the film dropped to number six, grossing $7.9 million. Rotten Tomatoes, a review aggregator, reports that 7% of 109 critics gave the film a positive review; the average rating is 2.7/10. The site's critical consensus reads, "While it's almost certainly the movie event of the year for filmgoers passionate about deer urine humor, Grown Ups 2 will bore, annoy, and disgust audiences of nearly every other persuasion." On Metacritic, the film has a score of 19 out of 100 based on 28 critics, indicating "overwhelming dislike". Audiences polled by CinemaScore gave the film an average grade of "B" on an A+ to F scale, the same grade earned by its predecessor. John DeFore of The Hollywood Reporter said, "Throughout, gags are cartoonishly broad and afforded so little time for setup and delivery we seem to be watching less a story than a catalog of tossed-out material." 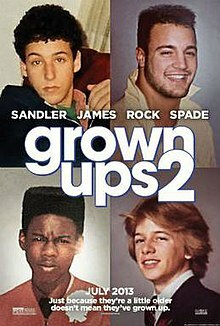 Andrew Barker of Variety said, "Among the slackest, laziest, least movie-like movies released by a major studio in the last decade, "Grown Ups 2" is perhaps the closest Hollywood has yet come to making "Ow, My Balls!" seem like a plausible future project." Mick LaSalle of the San Francisco Chronicle gave the film one out of four stars, saying, "The temptation arises to say something nice about "Grown Ups 2" just because it doesn't cause injury. But no, it's a bad movie, just old-school bad, the kind that's merely lousy and not an occasion for migraines or night sweats." Linda Barnard of the Toronto Star gave the film zero out of four stars, saying, "Adam Sandler scrapes the bottom of the barrel—and then he pukes into it—with Grown Ups 2, a lazily cribbed-together swamp of pointless and unfunny sketches that makes 2010’s Grown Ups look like Citizen Kane." Matt Patches of Time Out New York gave the film one out of five stars, saying, "In the first five minutes, a deer walks into the star's bedroom and urinates on his face. It's all downhill from there." Rafer Guzman of Newsday gave the film one out of four stars, saying, "For all its warm and fuzzy notions of family and community, Grown Ups 2... has a desperate reliance on nasty jokes about pee, poo and – with surprising frequency – gay panic." Owen Gleiberman of Entertainment Weekly, who gave the film a B, said, "In certain ways, Grown Ups 2 marks a return to classically Sandlerian infantile anarchy." Mark Olsen of the Los Angeles Times gave the film one and a half stars out of five, saying, "Grown Ups 2 looks like it was a lot of fun to make. And the last laugh is on us." Elizabeth Weitzman of the New York Daily News gave the film two out of five stars, saying, "Like most Adam Sandler movies, it’s exactly like most Adam Sandler movies... This movie stars all Sandler’s buddies and gleefully embraces lowbrow crudity even while promoting loving family values." Ignatiy Vishnevetsky of The A.V. Club gave the film a D–, saying, "Largely free of Sandler’s usual schmaltz and lame romance, it’s pure plotless, grotesque high jinks, bizarre and inept in a way that’s fascinating without ever being all that funny." Nick Schager of The Village Voice gave the film a negative review, saying "A few decent one-liners notwithstanding, the movie comes off as willfully uninspired." Claudia Puig of USA Today gave the film one star out of four, saying, "Mystifyingly, the movie manages to emerge plot-free. Instead, it offers a succession of humorless gross-out gags, fat jokes, suggestive posturing, bullying, belches and pratfalls. Life is simple – and gross – in Sandlerville." Sara Stewart of the New York Post gave the film half a star out of four, saying, "The movie lurches from one gross-out scene to another, flipping the bird at continuity and logic. It honestly seems as if Sandler and his team descended on a random suburb, halfheartedly improvising and moving on when they got bored." Stephanie Merry of The Washington Post gave the film one and a half stars out of four, saying, "Grown Ups 2 isn’t merely mindless. At times it seems to actually drain IQ points from its viewers while wasting a talented cast of “Saturday Night Live” alums, who are all capable of being much smarter and so much funnier." Andy Webster of The New York Times gave the film one out of five stars, saying, "This is pap, plain and simple: scattered raunch-lite devoid of emotional resonance. At best, it sells itself on the spectacle of a TV show’s cast reunion—and even then it disappoints. With the debacles of That's My Boy and Jack and Jill, Mr. Sandler has increasingly squandered his comic capital. His onetime SNL brethren do themselves few favors—beyond a paycheck—by working in his orbit." Peter Keough of The Boston Globe gave the film one and a half stars out of four, saying, "Apparently the world demanded another family-friendly version of The Hangover, one that combined scatological comedy with smarmy sentimentality." Connie Ogle of the Miami Herald gave the film one out of four stars, saying, "Nobody escapes untainted by the foul stench of Grown Ups 2; it’s bad enough to make you look askance at Salma Hayek, Maria Bello, and Maya Rudolph, all of whom deserve a chance to do something funny other than pose as wives exuding various degrees of sexiness." Richard Roeper gave the film one and a half stars, saying, "When Taylor Lautner is the funniest thing in a movie starring Adam Sandler and Chris Rock, we're in trouble." Randy Cordova of The Arizona Republic gave the film one out of five stars, saying, "In its own way, "Grown Ups 2" sets the bar really high. After all, it’s hard to imagine another comedy coming along this year that is this abrasive and free of laughs. It’s like everyone involved intentionally tried to create a horrible movie." Alonso Duralde of The Wrap wrote, "Yes, it's time for another visit to the Adam Sandler Death-of-Cinema Fun Factory, the big-screen version of a terrible sitcom where laugh tracks are replaced by the co-stars chuckling at their own awful material." Adam Nayman of The Globe and Mail gave the film two out four stars, saying, "None of the stars are trying very hard, and so the most memorable presences are the cameos: If nothing else, Grown Ups 2 will go down as the only film in history to find room for Steve Buscemi alongside "Stone Cold" Steve Austin." Grown Ups 2 was released on DVD and Blu-ray on November 5, 2013. Maria Bello said in an interview, "People have talked about it and we’ve heard it might happen, but I don’t know if there is a script, I don’t know what there is. But I hope so because, boy, it’s fun to work with those guys." On Netflix's Adam Sandler 100% Fresh, Sandler refers to filming Grown Ups 3 in the song "Farley" . ^ a b "Grown Ups 2". AFI Catalog of Feature Films. Retrieved 2017-06-20. ^ "GROWN UPS 2 (12A)". British Board of Film Classification. April 12, 2013. Archived from the original on May 4, 2013. Retrieved April 15, 2013. ^ Kaufman, Amy (July 11, 2013). "With 'Grown Ups 2' poised for strong debut, will 'Pacific Rim' flop?". latimes.com. Retrieved July 12, 2013. ^ a b "Grown Ups 2 (2013)". Box Office Mojo. Retrieved November 26, 2013. ^ "All these towns have to do is act naturally - North". The Boston Globe. June 14, 2012. Retrieved July 7, 2013. ^ "Grown Ups Sequel Planned". ComingSoon.net. Retrieved December 7, 2011. ^ "Where Is Your God Now: GROWN UPS 2 Set for July 12, 2013 | Collider | Page 137713". Collider. January 15, 2012. Retrieved July 7, 2013. ^ "Rob Schneider: 'Sandler Left Me Out Of Grown Ups 2′ « CBS Houston". Houston.cbslocal.com. 2012-05-25. Retrieved 2014-05-05. ^ "Photo: "Stone Cold" Steve Austin In Grown Ups 2 Movie Poster". PWMania. Retrieved July 12, 2013. ^ "Grown Ups 2 Clip: Adam Sandler vs. Taylor Lautner". Movie Fanatic. June 11, 2013. Retrieved July 12, 2013. ^ "First Look: Shaquille O'Neal in "Grown Ups 2"". WorstPreviews.com. Retrieved May 24, 2012. ^ "Taylor Lautner, Patrick Schwarzenegger In Grown Ups 2 Trailer". ETonline.com. April 29, 2013. Retrieved July 12, 2013. ^ "Arnold Schwarzenegger's Son Joins "Grown Ups" Sequel". Worstpreviews.com. July 10, 2012. Retrieved February 20, 2013. ^ "The Trailer for Grown Ups 2 is Here!". ComingSoon.net. April 2, 2013. Retrieved July 7, 2013. ^ Mendelson, Scott (July 13, 2013). "Friday Box Office: 'Pacific Rim' Grosses $14.6m, 'Grown Ups 2' Grosses $16.3m". Forbes. Retrieved July 14, 2013. ^ "Weekend Box Office Results for July 12-14, 2013". Box Office Mojo. Retrieved July 14, 2013. ^ "Weekend Box Office Results for July 19-21, 2013". Box Office Mojo. Retrieved January 15, 2014. ^ a b "Weekend Box Office Results for July 26-28, 2013". Box Office Mojo. Retrieved January 15, 2014. ^ "Grown Ups 2 (2013)". Rotten Tomatoes. Retrieved April 19, 2018. ^ "Grown Ups 2 Reviews". Metacritic. Retrieved October 21, 2014. ^ DeFore, John (November 17, 2011). "Grown Ups 2: Film Review". The Hollywood Reporter. Retrieved July 12, 2013. ^ Kroll, Justin (June 13, 2013). "'Grown Ups 2′ Review: Adam Sandler Stars in Tasteless, Storyless Sequel". Variety. Retrieved July 12, 2013. ^ Mick LaSalle. "'Grown Ups 2' review: Gang's back - minus the laughs - San Francisco Chronicle". Sfchronicle.com. Retrieved July 12, 2013. ^ July 12, 2013 12:04 AM EDT Facebook Twitter RSS (July 11, 2013). "Adam Sandler's Grown Ups 2 a gross and lazy no-star flop: review | Toronto Star". Thestar.com. Retrieved July 12, 2013. ^ Matt Patches (July 12, 2013). "Grown Ups 2: movie review | review, synopsis, book tickets, showtimes, movie release date | Time Out New York". Timeout.com. Retrieved August 18, 2013. ^ "'Grown Ups 2' review: Gross-out humor". Newsday.com. July 12, 2012. Retrieved July 12, 2013. ^ Owen Gleiberman. "Grown Ups 2 Movie Review | Movie Reviews and News | Summer Movies - Calendar, Trailers, Movie Photos, Movie Clips, Movie Guide". EW.com. Retrieved July 12, 2013. ^ Olsen, Mark (July 11, 2013). "Review: 'Grown Ups 2' refuses to leave the sandbox". latimes.com. Retrieved July 12, 2013. ^ "'Grown Ups 2': movie review". New York: NY Daily News. Retrieved July 12, 2013. ^ Vishnevetsky, Ignatiy (July 11, 2013). "Grown Ups 2 | Film | Movie Review". The A.V. Club. Retrieved July 20, 2013. ^ Nick Schager (July 11, 2013). "Grown Ups 2 Has No Real Plot to Speak of - Page 1 - Movies - New York". Village Voice. Retrieved August 18, 2013. ^ Puig, Claudia (July 11, 2013). "'Grown-Ups 2' is groan-inducingly bad". Usatoday.com. Retrieved July 12, 2013. ^ Stewart, Sara (July 11, 2013). "'Grown Ups 2' movie review". NYPOST.com. Retrieved July 12, 2013. ^ Merry, Stephanie (July 11, 2013). "'Grown Ups 2' review: Adam Sandler and friends up to more immature idiocy". The Washington Post. Retrieved July 12, 2013. ^ Keough, Peter. "Growing up is hard to do - Movies". Boston.com. Archived from the original on July 17, 2013. Retrieved July 12, 2013. ^ Ogle, Connie. "'Grown Ups 2' (PG-13)". miami.com. Retrieved August 18, 2013. ^ "Grown-Ups 2 Review". RichardRoeper.com. Retrieved July 12, 2013. ^ "The Arizona Republic". Azcentral.com. Retrieved July 15, 2013. ^ Duralde, Alonso. "'Grown Ups 2' Review: See Adam Sandler, Chris Rock Chuckle at Their Own Moronic Jokes | The Wrap Movies". Thewrap.com. Retrieved July 20, 2013. ^ Adam Nayman (July 11, 2013). "Grown Ups 2: Sandler's buddies comedy is sincere, if not a little lazy and indifferent". Toronto: The Globe and Mail. Retrieved November 3, 2013. ^ "Nominations for the 34th Annual Razzie Awards Announced". ComingSoon.net. Retrieved January 15, 2014. ^ "Grown Ups 2 Blu-ray". Blu-ray.com. Retrieved September 11, 2013. ^ "Exclusive: Maria Bello gives an update on Grown Ups 3". Flickering Myth. 2016-07-09. Retrieved 2018-02-26.